"Gummy" and "Gummi" redirect here. For other uses, see Gummy (disambiguation). Gummies, gummy candies, or jelly candies are a broad category of gelatin-based chewable sweets. Gummi bears and Jelly Babies are widely popular and are a well-known part of the sweets industry. Gummies are available in a wide variety of shapes, most commonly colourful depictions of living things such as bears, babies, sharks, worms, frogs, fish, snakes, lizards, spiders, dinosaurs, dolphins, turtles and bats. Various brands such as Bassett's, Haribo, Betty Crocker, Disney and Kellogg's manufacture various forms of Gummi snacks, often targeted at young children. The name "gummi" originated in Germany,  with the term "jelly" more common in English-speaking countries. Gummies have a long history as a popular confectionery. The first gelatin based shaped candy was the Unclaimed Babies, sold by Fryers of Lancashire in 1864. Disney capitalized on making a children's show with gummy based characters in 1985 called Disney's Adventures of the Gummi Bears. Gummy bears are now consumed worldwide as a sweet or sour treat. The Jelly Babies gum candy was the first commercialy available shaped gum candy. It originated in the United Kingdom. First produced by Fryers of Lancashire in 1864 and sold as "Unclaimed Babies". By 1918 they were (and still are) produced by Basset's in Sheffield as Jelly Babies. Haribo gummy bears were first made in Germany. 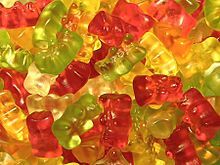 The gummi bear originated in Germany, where it is popular under the name Gummibär (rubber bear) or Gummibärchen (little rubber bear). Hans Riegel Sr., a maker from Bonn, produced these sweets under the Haribo company, which he started in 1920. 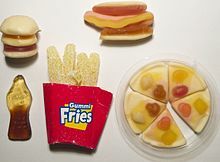 A cola bottle gummi , alongside a gummi hot dog, pizza, hamburger, and box of fries. Cola bottles are sweets in the shape of classic Coca-Cola-style bottles with a cola flavor. They are produced by numerous companies. 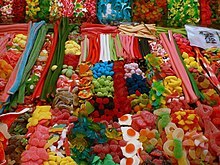 "Fizzy Blue Bottles", made by Lutti (formerly part of the French division of the Leaf Company, now controlled by a private investment group), are sweets typically found in a pick and mix selection. These are very similar to cola bottle gummies in shape, but they are usually sour and coloured blue and pink. "Blue Bottles", a variation from another company, are identifiable by the small rims around the sides, and are chewier and thicker, with a sweeter taste. Ring-shaped gummi is often covered in sugar or sour powder. The most common and popular flavor is the peach ring. Other flavors include green apple, melon, blue raspberry, strawberry, and aniseed - although these are typically coated in chocolate. A commonly known producer of gummi rings is Trolli, for which the gummi rings are an important asset. In Australia, jelly confectionery in the shape of frogs has been very popular since the 1930s. They are colored red or green, although they are usually referred to as "red frogs". These have influenced the shape, structure, consistency and formula that makes gummy bears. Red frog gummies are not associated with the Red Frogs Association. In February 2005, following complaints by the New Jersey Society for the Prevention of Cruelty to Animals, Kraft decided to stop production of the controversial Trolli U.S. Road Kill Gummies. The society complained that the products, shaped as partly flattened squirrels, chickens and snakes, would give children an incorrect message on the proper treatment of animals. In Australia, jelly confectionery in the shape of teeth has been very popular since the 1930s. They are colored pink and white, with pink representing the gums and teeth being white. They have a slight minty flavor, similar to mint toothpaste. There are many types of Gummy Worms, and Trolli produces glow worm gummies, with glowing color and sour sugar. There are also many types of gummy sharks but the blue and white ones are the most popular. There are also several multi-vitamin gummi bears, usually marketed for children, such as Flintstones Chewable Vitamins. These form of vitamins give off nutrients and protein for those that do not swallow pills or need various supplements to stay healthy. Gummies landed on the "What's out in 2009" list for some Canadian schools, along with chocolate, fudge, chocolate coated nuts and fruit, bubble gum, lollipops, toffee, jelly beans, marshmallows, sherbet, and Turkish delight. An audit in Victoria, British Columbia, was planned for 2009 to ensure the government banned the selling of the confectionery treat in school stores and vending machines as directed. Scientists have studied adding the tooth-protecting sugar substitute xylitol to gummies to fight tooth decay. Choking risks are higher with gummi candies; research shows that "hard, round foods with high elasticity or lubricity properties, or both, pose a significant level of risk," especially to children under three years of age. This can be resolved with the Heimlich maneuver. ^ Magazine, Bon Appetit. "A Brief History of Gummy Bears - Bon Appétit". Bon Appétit. Retrieved 2016-10-13. ^ "Sweet success: Unravelling the Jelly Baby's dark past". ^ "Trolli - trolliapfelringe225g". Trolli.de. Retrieved 2011-12-15. ^ "Trolli Road Kill dies under pressure from animal activists". Business. 1 March 2005. Archived from the original on 26 October 2012. Retrieved 19 February 2010. ^ "Flintstones Vitamins | Multivitamins & Supplements for Kids". www.flintstonesvitamins.com. Retrieved 2016-09-27. ^ a b "Schools join in healthy eating". The Stawell Times News. 25 November 2008. Retrieved 19 February 2010. ^ "Gummy Bears Can Fight Cavities". OneIndia.in. ANI. 2008. Retrieved 19 February 2010.